Affiliation: Dept of Electrical and Computer Engineering, Rice University, Houston, Texas 77005, USA. Maximum modulation of light transmission occurs when an initially opaque medium is suddenly made transparent. This dramatic phenomenon, induced transparency, indeed occurs in atomic and molecular gases through different mechanisms [1,2], while there remains much room for further studies in solids. A plasma is an illustrative system exhibiting opacity, where light is completely reflected if its frequency is smaller than the plasma frequency. Light-plasma interaction theory provides a universal framework to describe such diverse phenomena and systems as radiation in space plasmas, diagnostics of laboratory plasmas, and collective excitations in condensed matter. However, quite surprisingly, induced transparency in plasmas is a rather uncharted area of research. In a paper published online in Nature Physics on December 6, 2009, researchers at Rice University, Texas A&M University, and Los Alamos National Laboratory reported a novel type of thermally- and magnetically-induced transparency in a semiconductor plasma, revealed by coherent terahertz (THz) magneto-spectroscopy . They observed a sudden appearance and disappearance of transmission through a slab of electron-doped InSb over narrow temperature and magnetic field ranges. To explain these striking observations, the researchers developed a theoretical model based on coherent interference between the left- and right-circularly polarized eigenmodes of the low-density magneto-plasma in InSb. Detailed simulations demonstrated how the observed THz modulation and interference effects depend sensitively on the magnetic field, as well as on the temperature through the intrinsic carrier density of narrow-gap semiconductors. Excellent agreement between experiment and theory demonstrated surprisingly long-lived coherence of magnetoplasmon excitations. The free electrons in the conduction band of doped narrow-gap semiconductors, e.g., InSb, InAs, and HgCdTe, behave as classic solid-state plasmas and have been examined through a number of infrared spectroscopy studies [4,5]. Due to the low electron densities achievable in these materials and to the electrons’ small effective mass and high mobility, most of the important energy scales (the cyclotron energy, the plasma energy, the Fermi energy, intra-donor transition energies, etc.) can all lie within the same narrow energy range from ~1 to 10 meV, or the THz frequency range (1 THz = 4.1 meV). The interplay between these material properties, which are tunable with magnetic field, doping density, and/or temperature, make doped narrow-gap semiconductors a useful material system in which to probe and explore novel phenomena that can be exploited for future THz technology. The Rice researchers used a time-domain THz magneto-spectroscopy system  with a linearly-polarized, coherent THz beam to investigate magneto-plasmonic effects in a lightly n-doped InSb sample that exhibits a sharp plasma edge at ~0.3 THz at zero magnetic field as well as sharp absorption and dispersion features around the cyclotron resonance. These spectral features can be sensitively controlled by changing the magnetic field and temperature due to the very small effective masses of electrons and low thermal excitation energy in this narrow-gap semiconductor. Furthermore, long decoherence times (< 40 ps) of electron cyclotron oscillations give rise to sharp interference fringes and coherent beating between different normal modes (coupled photon-magneto-plasmon excitations) of the semiconductor plasma. Figure 1 (click on the image to see hi resolution version) Temperature dependence of THz transmittance spectra for lightly-doped InSb in a magnetic field. a, Transmittance versus temperature at 0.25 THz at a magnetic field of 0.9 T (corresponding to a horizontal cut in the contour map of b), showing thermally induced transparency. b, Measured and c, calculated transmittance contour as a function of temperature (2-240 K) and frequency (0.12-2.6 THz) at a fixed magnetic field of 0.9 T. d, Transmittance versus magnetic field at 0.25 THz at a temperature of 40 K (corresponding to a horizontal cut in the contour map of e), showing magnetically induced transparency. e, Measured and f, calculated transmittance contour as a function of magnetic field (0-2 T) and frequency (0.12-2.6 THz) at a fixed temperature of 40 K.
As an example, the temperature (Figs. 1a, 1b, and 1c) and magnetic field (Figs. 1d, 1e, and 1f) dependence of THz transmittance spectra are shown. A striking feature in both Figs. 1a and 1d is a narrow range of temperature (1a) and magnetic field (1d) where the transmission of THz light is high. Figure 1b shows a full contour map of the transmittance as a function of frequency and temperature at a fixed magnetic field. Figure 1c shows a calculated contour plot of the transmittance, based on their model. A horizontal cut of the contour at 0.25 THz is shown in Fig. 1a. Similarly, Figs. 1e and 1f show, respectively, measured and calculated contour plots of the transmittance as a function of frequency and magnetic field. A horizontal cut of the contour at 0.25 THz is shown in Fig. 1d. At zero magnetic field, the only spectral feature appearing in our InSb samples is the plasma edge at the plasma frequency (0.3 THz). When a magnetic field is applied along the wave propagation direction, the incident linearly-polarized THz wave propagates in the sample as a superposition of the two transverse normal modes of the magneto-plasma: the left-circularly-polarized mode, called the ‘extraordinary’ or cyclotron resonance active (CRA) wave, and the right-circularly-polarized mode, called the ‘ordinary’ or cyclotron resonance inactive (CRI) wave. The CRA mode couples with the cyclotron motion of electrons. With increasing magnetic field, the plasma edge splits into the two magnetoplasmon frequencies for the CRA and CRI modes. The THz response of the InSb sample was modeled through a dielectric tensor for a classical magneto-plasma for both electrons and holes, including the effect of conduction band non-parabolicity. The CRA wave experiences strong absorption and dispersion, while the transmission of the CRI mode is nearly flat and featureless everywhere except at very low frequencies. Simple addition of the two, however, does not produce any of the experimentally observed spectral features. What is measured experimentally is a superposition of the two fields, which contains the interference between the CRA and CRI modes. The interference term depends on the index difference between the two modes, and its inclusion in the simulation indeed totally modified the spectra at finite magnetic fields. The agreement between theory and experiment is outstanding. The positions and shapes of all the transmission peaks, plateaus, and dips in the spectra are accurately reproduced in great detail, confirming the accuracy of our interpretation and theoretical model and indicating the long coherence times of coupled photon-magnetoplasmon excitations reaching tens of ps. The dominant process affecting the temperature dependence of the dielectric tensor at elevated temperatures is the thermal excitation of intrinsic carriers across the band gap given, which leads to an exponentially growing plasma frequency. The density of intrinsic carriers eventually exceeds the doping density at ~180 K. Therefore, one would expect a weakly temperature-dependent transmittance below ~180 K that would abruptly decrease above this temperature due to the exponentially growing plasma frequency. The intensities of individually-transmitted CRA and CRI modes indeed exhibit this expected temperature dependence. However, again, one has to include the interference term in calculating the transmission. With realistic parameters for the sample and experimental conditions, this interference term is negative and almost exactly cancels the other two terms below 160 K, leading to interference-induced opacity. As the temperature increases above 160 K, the difference between the refractive indices of the two modes starts growing exponentially, causing strong oscillations in the total transmittance due to interference. These oscillations, however, are strongly damped above 200 K due to the exponentially growing absorption coefficient for both normal modes. As a result, only one strong peak remains prominent, followed by a few progressively smaller peaks, explaining the existence of the observed transparency bands. This is further illustrated by the excellent agreement between the observed and calculated temperature dependence of transmittance in Figs. 1b and 1e (experiment) and 1c and 1f (theory). These results demonstrate that free carrier plasmas in lightly-doped narrow-gap semiconductors are promising materials systems for THz physics, exhibiting huge magnetic anisotropy effects and plasmon excitations in the THz range that are highly tunable with external fields, temperature, and doping. In particular, coherent interference phenomena, which are commonly observed and used in the visible and near-infrared range, can be extended into the THz regime. Moreover, the observed novel interference phenomena depend sensitively on plasma properties and carrier interactions, and thus, can be used to study solid-state plasmas over a vast range of external fields and temperatures from the classical limit to the ultra-quantum limit. This experimental finding may open up further new opportunities for using coherent THz methods to probe more exotic phenomena in condensed matter systems that occur due to many-body interactions and disorder. Harris, S. E. "Electromagnetically induced transparency". Phys. Today 50, 36-42 (1997). Abstract. McCall, S. L. & Hahn, E. L. "Self-induced transparency by pulsed coherent light", Phys. Rev. Lett. 18, 908-911 (1967). Abstract. X. Wang, A. A. Belyanin, S. A. Crooker, D. M. Mittleman, and J. Kono, “Interference-Induced Terahertz Transparency in a Semiconductor Magneto-plasma,” Nature Physics, published online on December 6, 2009. Abstract. Rice University Press Release. 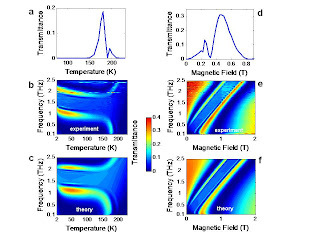 Palik, E. D. & Furdyna, J. K. "Infrared and microwave magnetoplasma effects in semiconductors". Rep. Prog. Phys. 33, 1193-1322 (1970). Abstract. McCombe, B. D & Wagner, R. J. in "Advances in Electronics and Electron Physics", Vol 37 (eds Marton, L.) 1-79 (Academic Press, 1975). Wang, X., Hilton, D. J., Ren, L., Mittleman, D. M., Kono, J. & Reno, J. L. "Terahertz time-domain magnetospectroscopy of a high-mobility two-dimensional electron gas". Optics Lett. 32, 1845-1847 (2007). Abstract.